← Are We Full Of Our Grandiose Selves? Yes, There Really IS A devil. I just read a very powerful verse of Scripture in the book of Revelation. Fear nothing that you are about to suffer. Dismiss your dread and your fears! Behold, the devil is indeed about to throw some of you into prison, that you may be tested and proved and critically appraised, and for ten days you will have affliction. Be loyally faithful unto death even if you must die for it, and I will give you the crown of life. FIRST we need to see that even believers suffer at times. That word “suffer” means, “in a bad sense, to suffer sadly, be in a bad plight, of a sick person.” So many Christians have been told that if they are suffering it’s because of their sin, their lack of faith, their unbelief, or even that God is just mad at them. NOT SO! Of course someone may have issues to take care of like sin or unbelief, but most who are suffering have already resolved those issues. They have usually taken a full inventory of their life just “to make sure” everything on their end is clean. Suffering happens BECAUSE of……the devil. Yes, there really IS a devil. That verse we just read says, “the devil is indeed about to throw some of you into prison.” WHO? The devil. Not sin. Not unbelief. Not God. The devil. NOTICE the first two words….“FEAR NOTHING…” Then it says, “Dismiss your dread and your fears!” Fear is not from God, it is from…..yes, the devil. The devil loves to see if he can cause you and me to see things BIGGER than they really are. He is an expert at deception and manipulation. 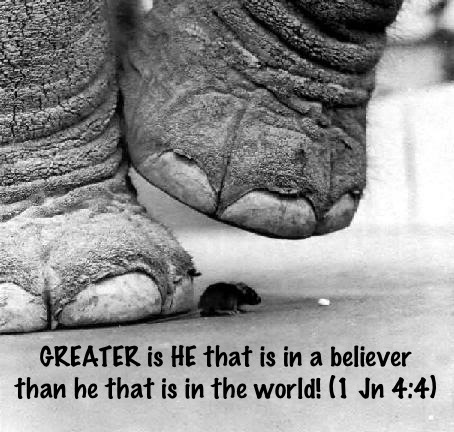 BUT…..GREATER is HE that is in a believer than he that is in the world! (1 John 4:4) We DO NOT have to accept, embrace, believe, or nurture thoughts of fear. We have the power of God’s Word which sends the devil fleeing. The key to our victory is our trust, our trust in God and our trust in His Word. We must CHOOSE to trust instead of choosing to be afraid. Listen, the only power the devil has is the power WE give him when we choose to believe his lies over God’s Word. Plug into God. Plug into the Word. And disconnect from fear. Have a great “fearless” weekend! This entry was posted in The E-quip Devotion and tagged devotion, e-quip, pastor kevin, thenetrev. Bookmark the permalink. Oops…indite…with an s…keeps changing to a d. I donot understand why he is convincedsatan is your mind. He said Jesus defeated him when he took the keys of hell. I just pray for understanding for him.